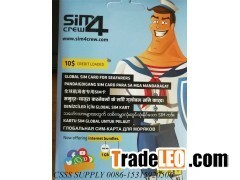 Sim4crew roams in more than 200 countries at local prices – meaning seafarers never need to buy a local sim card again. Operational in over 4,500 ports and 120 anchorage areas, the Sim4crew sim card enables users to surf the internet with high speed data and call home with excellent voice quality. Advanced roaming technology enables calls at superb prices, starting from just five cents a minute and data from nine cents a minute. And receiving sms and calls is free in most countries. online top-up options mean you need never run out of credit again. Payment can be made via credit card, PayPal or local payment systems such as Mobiamo, MOLpoints, Smart Money, Pasaload, Alipay, Tenpay, Yandex.Money and more. Other benefits of the Sim4crew card include the fact that credits never expire and the 24/7 assistance. Sim4crew works in all kinds of mobile phones, tablets, usb modems and hotspots and supports both call through and call back options. Tips：This page [sim4crew simcard] infomation provided by [RIZHAO CSSS OCEAN SHIPPING SUPPLY CO LTD] ,the enterprise is responsible for the authenticity, accuracy and validity of the information content. www.tradeleo.com do not assume any guarantee of joint and several liability. A safe way to suggest that the two sides trade, to ensure the interests of both sides.